Venture anywhere near central London and you’ll notice the sudden proliferation of large, black luxury limousines – of the sort regularly used by the rich and famous to ferry back and forth between important meetings and swanky gala dinners. Among these, if you keep track for a while, you’ll spot that the Audi A8 is one of the most popular. Now in its fourth generation, the A8 is probably the most discreet among its luxury limo rivals – that is to say, the Mercedes S-Class, BMW 7 Series and Jaguar XJ. But don’t mistake discretion for indifference; beneath the skin, this A8 is a true techno-fest, with a host of advancements that maintain the model’s reputation for groundbreaking technology. There’s a choice between a 282bhp 3.0-litre diesel (confusingly badged ‘50’) and a 335bhp 3.0-litre petrol (equally bizarrely badged ‘55’), both turbocharged – although a 429bhp V8 diesel will join the range soon. All of these engines have mild hybrid technology that provides a boost from an electric motor, and all can cut out completely while you’re coasting, leaving the car running on pure electric power for up to 40 seconds at a time. As far as the model range goes, there are two versions to pick from: the entry-level A8, which has no additional badging, and the S Line. As you’d expect, the basic car is very well equipped, with climate control, heated electric seats, leather upholstery, sat-nav, LED headlights and air suspension all coming as standard, among other features. S Line then adds larger wheels, adaptive high-beam headlights, LED rear lights, sports seats and privacy glass. You can also opt for your A8 in long-wheelbase ‘L’ form, in which case you also get heated rear seats, a tablet-style remote control for the infotainment system, four-zone climate control and electric rear sunblinds. 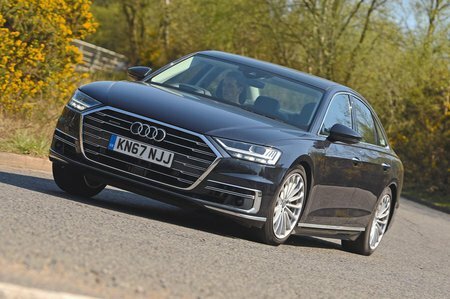 Granted, the A8 doesn’t have the precision of a Mercedes S-Class when it’s hustled along a back road quickly, but few – if any – A8 owners are ever going to drive their cars in this way. No, these cars are all about relaxation – and driving an A8 is about as relaxing as driving gets. The air suspension wafts you over bumps seamlessly, while engine noise is all but absent – and disappears altogether when you coast and it shuts off to run on electric power alone. There’s a faint whisper of wind noise and perhaps a background hum of road noise but, other than that, all is silent inside the A8. And indeed, inside the A8 is a marvellous place to be. It can’t quite match the glitz of the Mercedes S-Class, but the A8’s more understated furnishings are nevertheless deeply appealing, with slivers of open-pore wood, top-quality materials, and glossy touchscreens and touch switches everywhere. That latter point is a bugbear in use, mind you, for while these touch-sensitive controls look snazzy, they’re a pain to use, as you can’t work out where they are by feel alone – meaning you have to take your eyes off the road to do so. What’s more, a few greasy finger marks render them grubby. A key component of a luxury car is space, and in this regard the A8 delivers in spades. In fact, it’s questionable whether you’d really need the extra room of the long-wheelbase model, so spacious is the rear of the standard car. Up front all’s well too, with lots of useful cubbies and big, deep door pockets, while the boot is one of the biggest in its class, with almost as much volume as some small estate cars.